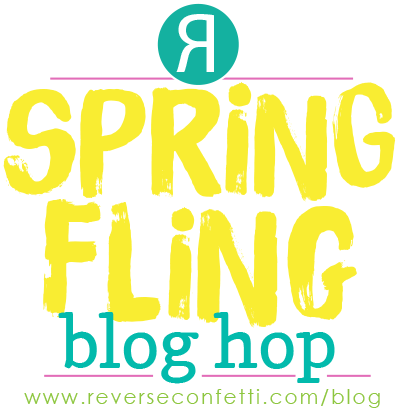 Welcome to Reverse Confetti's Spring Fling Blog Hop! Several of the design team girls are getting together today to share some cheery, springtime inspiration for you! The hop begins at the Reverse Confetti blog, where you'll find the hop list and all the giveaway info. If you're already hopping, you should have arrived here from Laurie Schmidlin's blog. And when you're finished here, you'll visit Lisa Henke next. 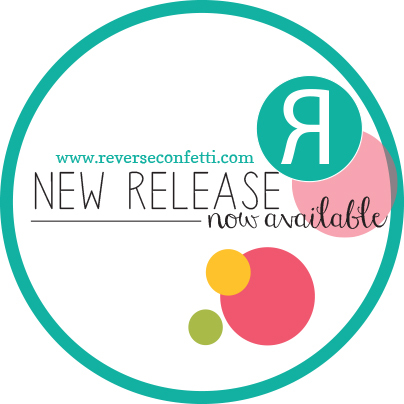 Be sure to leave a comment at each stop along the way for a chance to win a $15 gift certificate to the Reverse Confetti store ... just in time for our May 8 release (also Reverse Confetti's second birthday!). Comments are open until May 1. 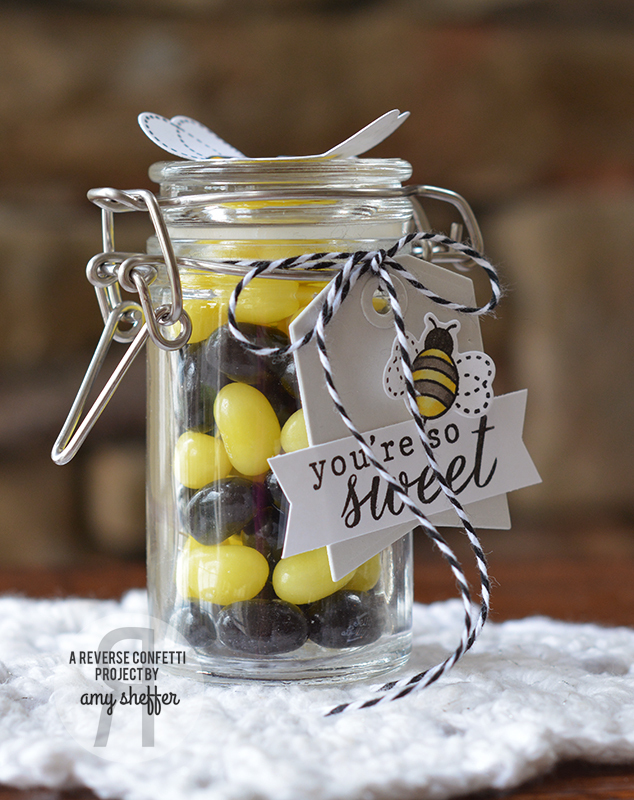 Teacher Appreciation is next week, and I've created an adorable and inexpensive treat using images and a sentiment from The Buzz, a miniature glass canister, and some yellow and black jelly beans. 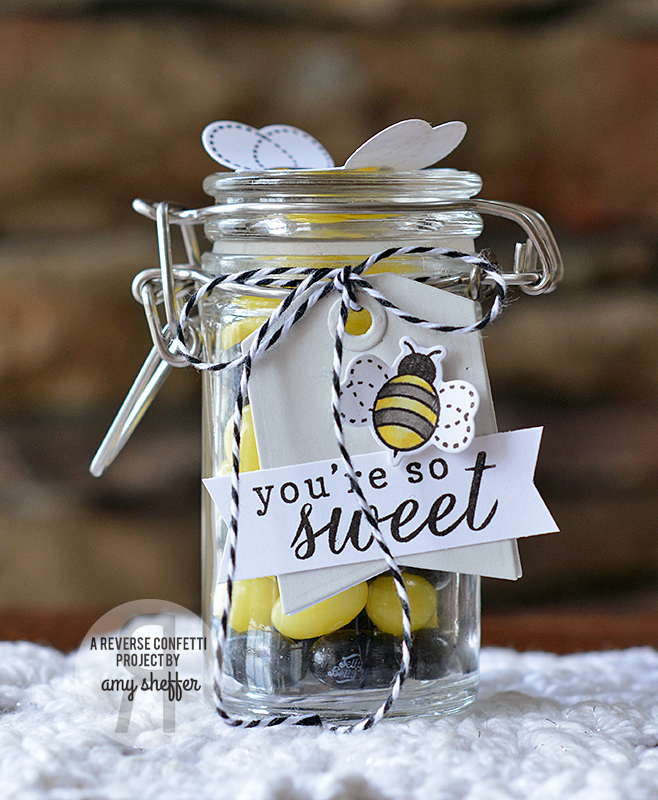 I picked up this darling miniature glass canister at Hobby Lobby recently, and filled it with layers of black and yellow jellybeans. I tied on a Tag Me Confetti Cuts die (the small one) with some black and white baker's twine. 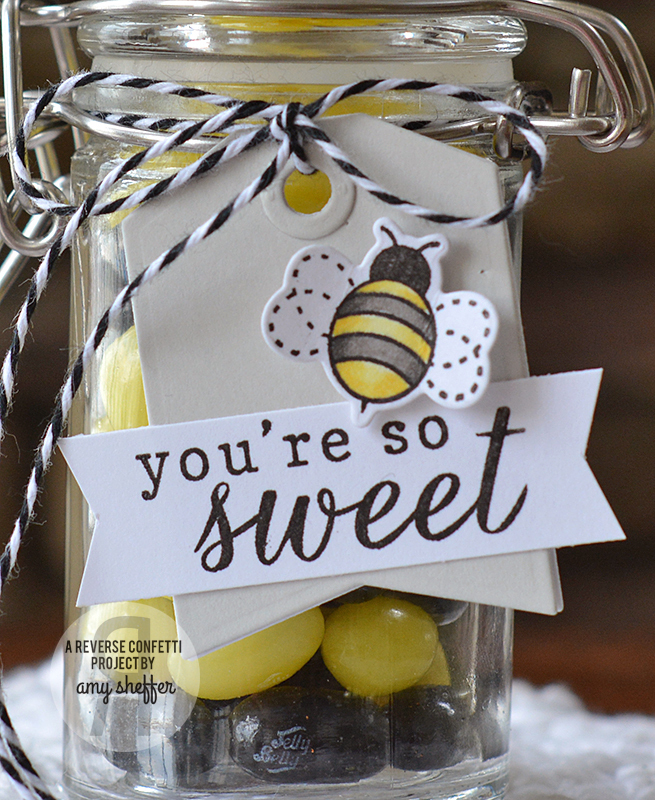 On the tag are a simple banner sentiment and a small bee, stamped with The Buzz and die-cut with The Buzz Confetti Cuts dies. 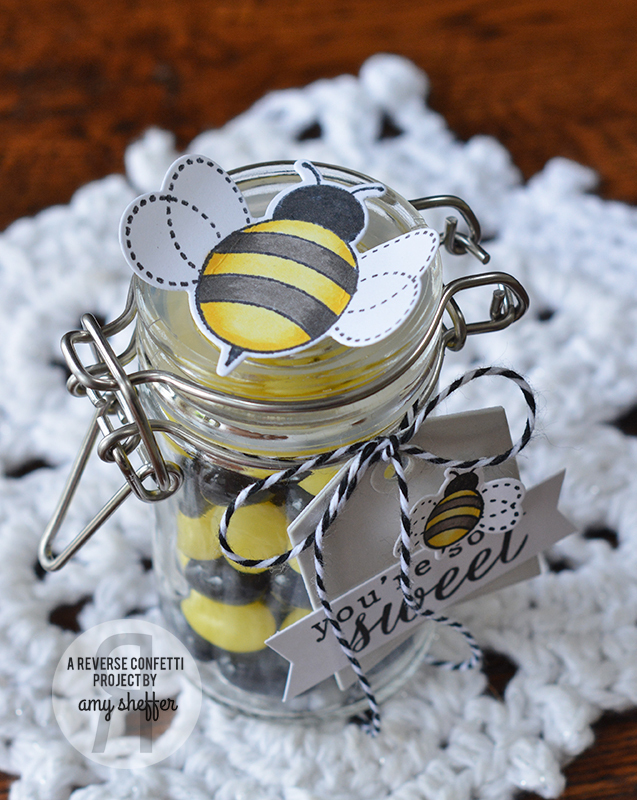 The top of the jar is the perfect size for the large bee, also from The Buzz I adhered the bee's body with a large glue dot, then curled the wings up for dimension. A closer look at the sweet tag. 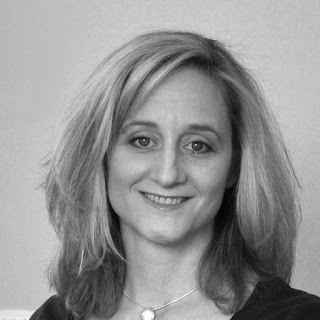 Your next stop: Lisa Henke. After you done hopping, head over to Reverse Confetti's Facebook page, where you'll find a "Win It Before You Can Buy It" promotion. Good luck! Enjoy the hop, and thanks so much for stopping by! Hello, friends! 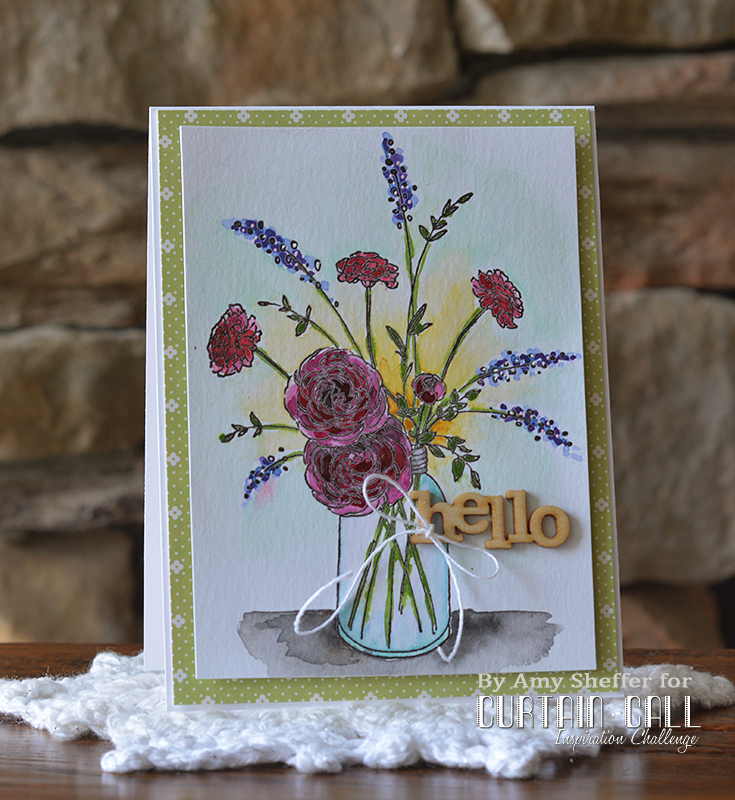 I wasn't able to post last week when the current Curtain Call Inspiration Challenge, Bouquet, was unveiled. But I'm here today with a reminder that it's not too late to join the challenge! The deadline to enter is April 25 at 8 am CST. 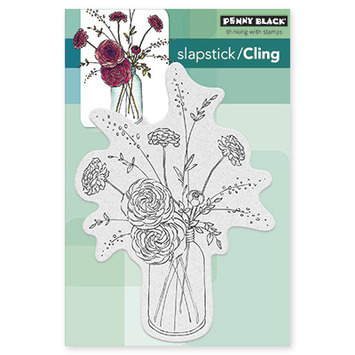 We have a new sponsor, Penny Black, for the Curtain Call Inspiration: Bouquet! A randomly selected participant in the Bouquet challenge will have their choice of a Penny Black gift certificate, while the LEAD will be invited as a Guest Designer in a future challenge! Penny Black generously gave the Curtain Call designers an image of their choice to work with for this challenge. It took me about half a second to pick Fragrant #40-384. Isn't it gorgeous? Not to mention perfect for the challenge? I stamped on watercolor paper and colored with Kuretake Gansai Tambi watercolors. I may have been a tad bit totally intimidated before sitting down to color this, but it ended up coming together very quickly! Now don't look too closely, as there are all sorts of mistakes, but the beauty of watercolor is that it is so very forgiving! This Fragrant image is a nice, large size, so once you've colored it, there's not a whole lot of room for layers and embellishments (at least not on an A2 card). I trimmed my panel down slightly, matted onto some patterned paper, and then just added a wood veneer sentiment and a sweet linen thread bow. 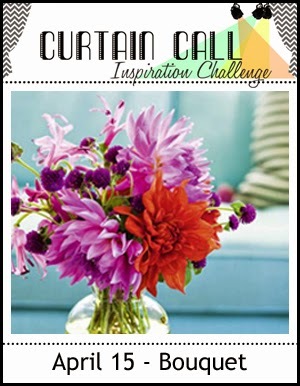 To link up your creation, visit the Curtain Call Inspiration Challenge: Bouquet post. For more inspiration today, visit the reminder post. 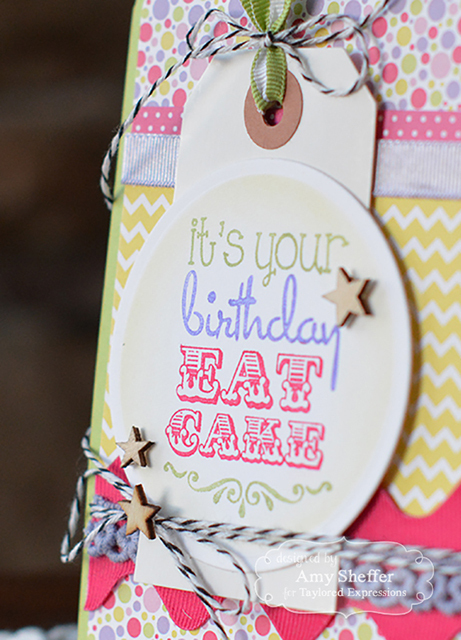 I'm up on the Taylored Expressions blog today with a super colorful, bright fun birthday card. 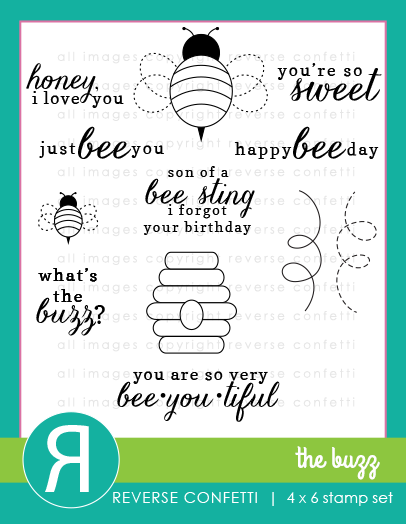 The TE Double the Fun paper pack is irresistible, and I love the font combinations in the Big Bold Birthday stamp set. Hope you'll join me over there! 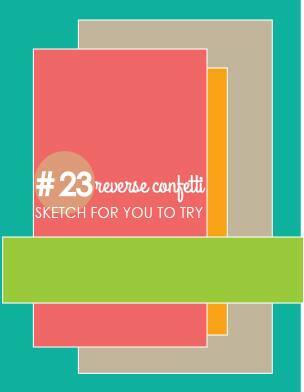 Have you played along with Reverse Confetti's April Sketch For You To Try? If no, there's still plenty of time! The deadline to link up your creation is April 29 at noon CST. What an awesome and easy-to-use sketch! 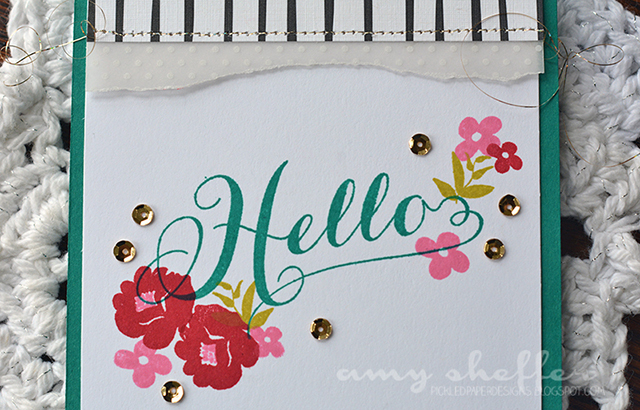 I opted for a no-stamping card that really highlights the beautiful new Hello Confetti Cuts die. 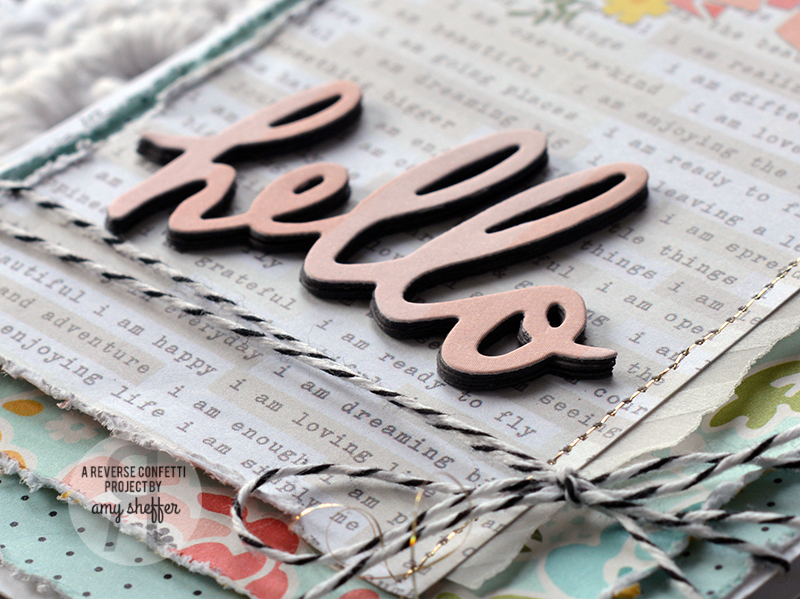 The top layer of the stack of hello die-cuts is out of a pink pattern from the Simple Stories I Am 6x6 collection. The next few layers are out of a dark gray card stock. 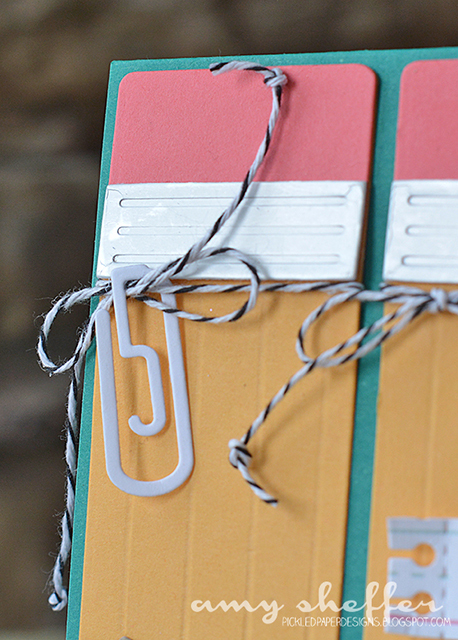 The rest is just pretty paper, gold stitching, a hint of vellum, and a cute clothespin. Super quick and easy! 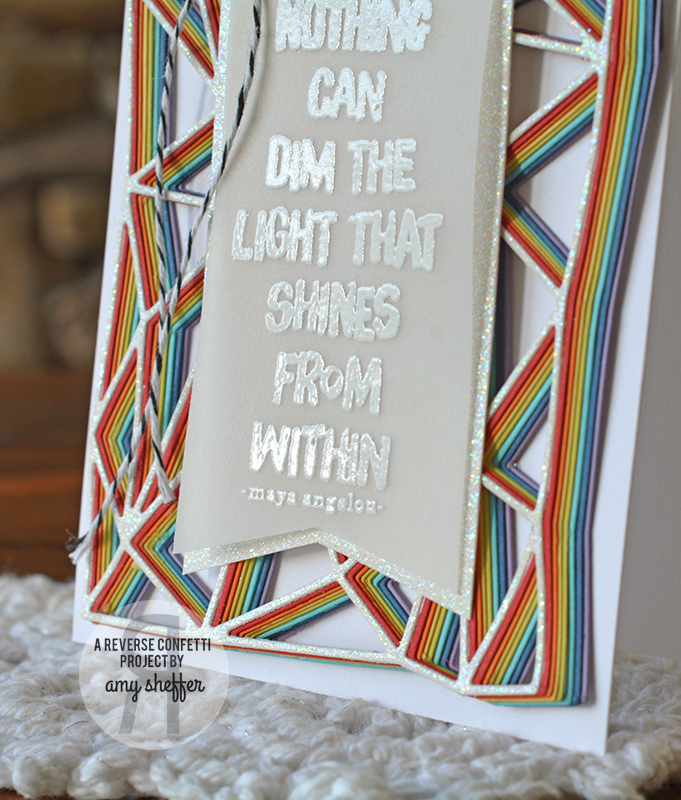 Visit the Reverse Confetti blog today for more sketch inspiration from the DT. Third (and final) post for today (I know, what's up, right?). For the current Curtain Call challenge, click HERE. 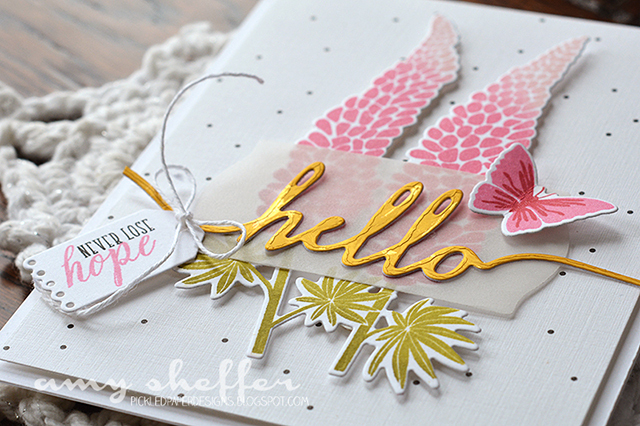 For my Papertrey April Release in Review post, click HERE. 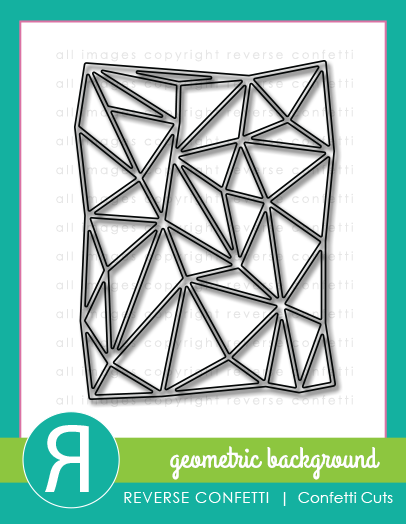 Just a heads up that I'm over on the Reverse Confetti blog today sharing a cool prism card using Reverse Confetti's new Geometric Background Confetti Cuts die. Here's a little teaser ... visit the Reverse Confetti blog for more info and photos! Second post today. For my Papertrey Release in Review, please scroll down or click HERE. It's release day at Papertrey Ink! All of the new products the team has been featuring the past week will be available for purchase tonight at 10 pm EST. I'm excited to share with you the rest of my April release projects, so let's get right to it! 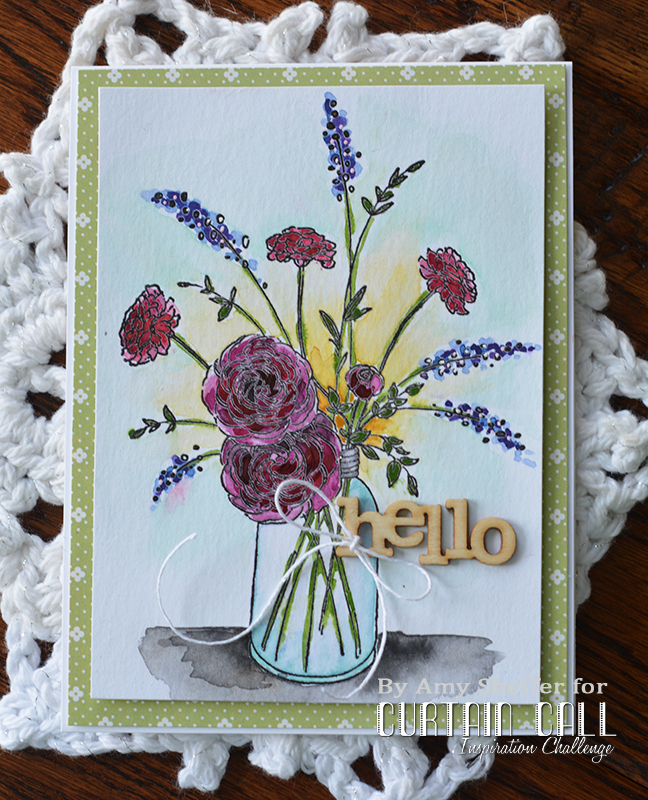 First up is Betsy's Graceful Greetings stamp set. 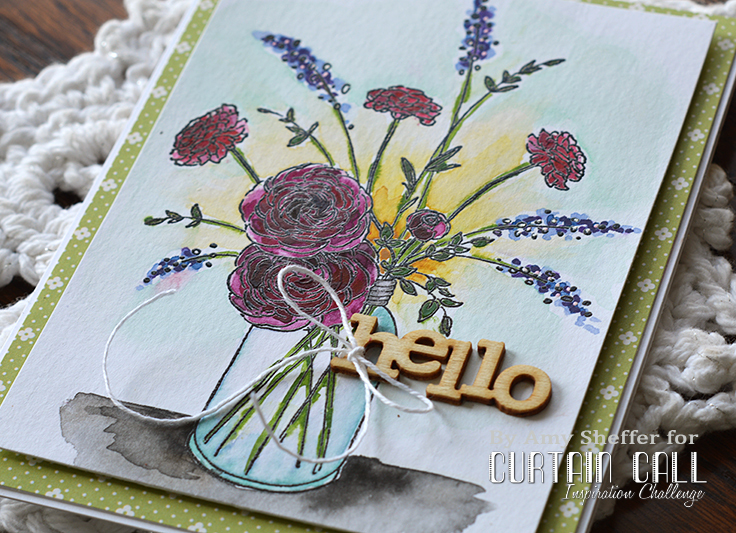 This is one of those sets that make it super easy to stamp a beautiful card in no time! Those large script sentiments are so eye-catching. Love! 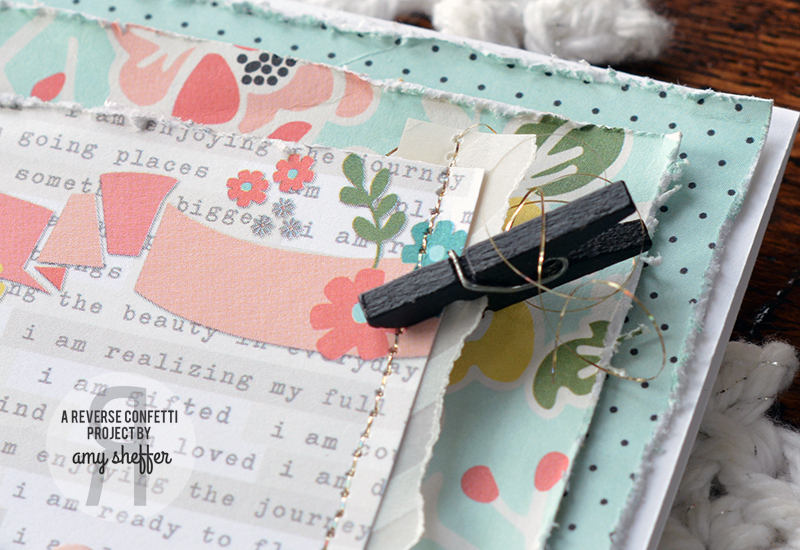 The border strip along the top is from Maile's new Black and White All Over paper collection. I added a tiny bit of Sheer Basics Vellum and stitched along the edge in gold metallic thread. These gorgeous lupines are from Nichole's Flower Favorites. I stamped the in three shades of pink using Laurie's ombre stamping technique that she shared in a recent Make It Monday video. 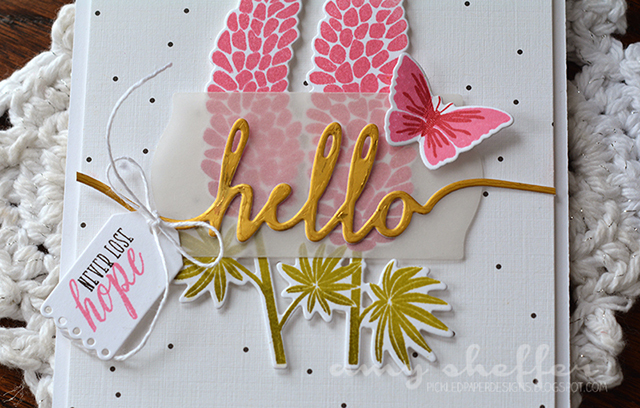 The gold "hello" was diecut with the new Super Swoosh die set out of Luxe Gold card stock. Love the larger size of these! The background pattern is from the Black and White All Over paper collection, and the "never lose hope" is part of Flower Favorites. Lots of nice sentiments to go with the flowers. 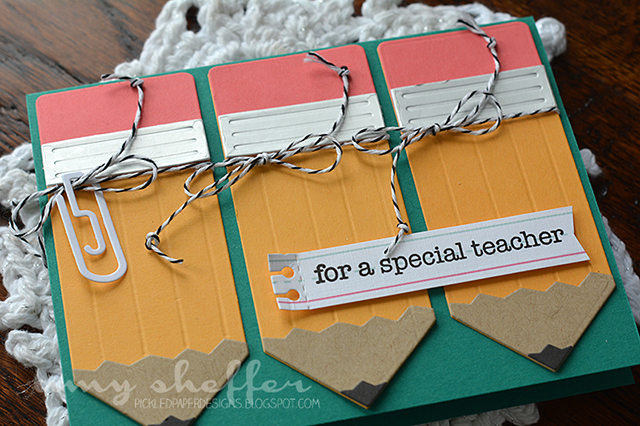 I adore all the teacher products in this release! 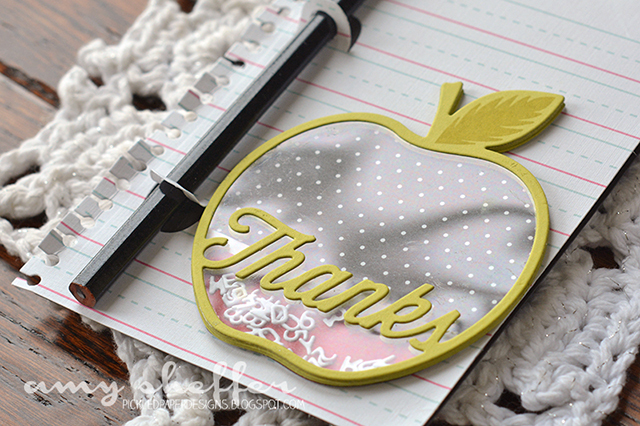 This is Dawn's Enclosed: Apple stamp set and die. I cut a bunch of layers with the frame die, stacked them, and created a shaker. The numbers and alphabet are from the new Shaker Shapes: Pencil die (more with the other parts of that die collection below). The pencil holder tabs were done with the Write Stuff Holders dies. Two different ones come in the set -- one is sized for standard pencils and the other has slightly larger holes, perfect for crayons. I ADORE this chunky Shaker Shapes: Pencil die set. Here, I've used just the main layers, but how fun that you can add the top frame layer to make it into a shaker! The silver band below the eraser was die-cut out of Luxe Silver card stock. That stuff is so thick and luxurious! The little #5 clip is from the Number Clips die set. These are so cute, and perfect for subtle little extra number details. I'll be giving this card to my daughter's 5th grade teacher, for example. 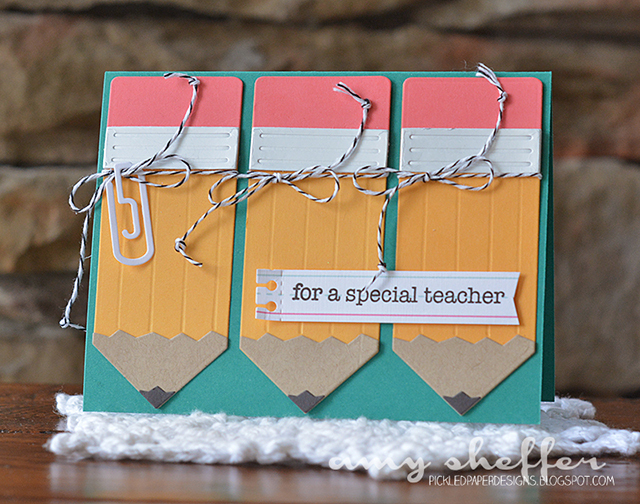 The sentiment, from Keep It Simple: Teacher is stamped onto one of the patterns from the Pencil Me In paper collection. The left edge of the sentiment strip is die-cut with the Moments Inked: Edged dies, both the spiral binding edge and the perforated line. The Petite Places series just gets better and better! Petite Places: School comes with so many fun extras, like the swing set, slide, picket fence, and flagpole. Seriously darling! Like the other buildings in the series, you can assemble the miniature 3D building or just use the building front like I've done here. 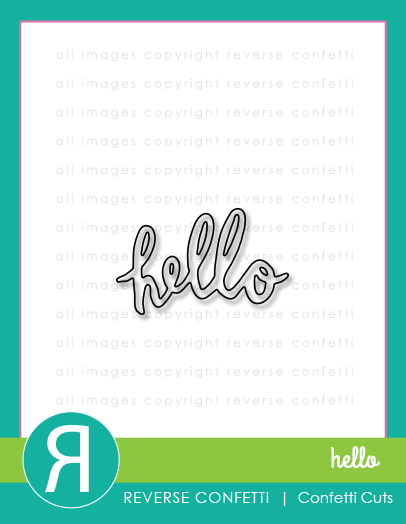 I've used another number clip, this time to help build a collage sentiment ("hello, number one teacher, thank you"). The hashtag is from the Pencilgrams set. 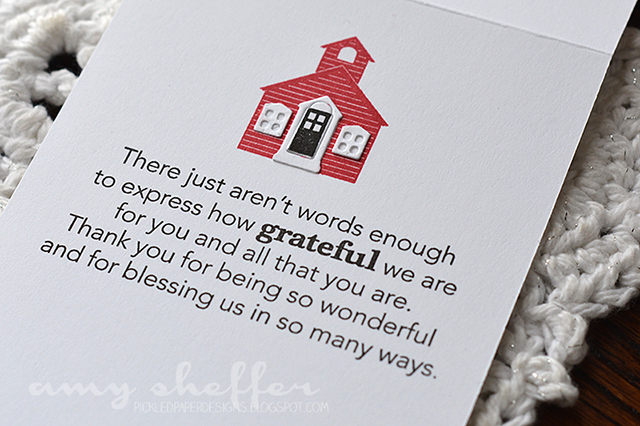 On the inside, I stamped another little schoolhouse (oh dear, I just realized I forgot the darling little bell! 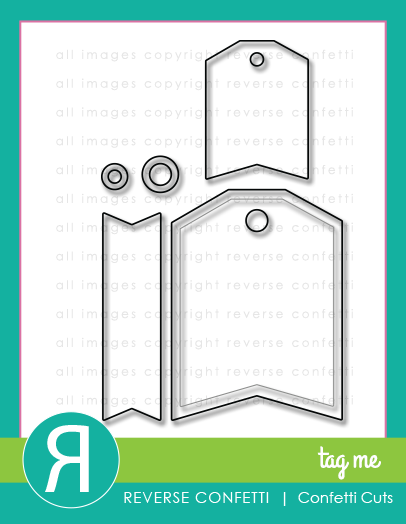 ), added the window and door frame die-cut pieces, and then stamped a sentiment from Tucked In: Thank You. 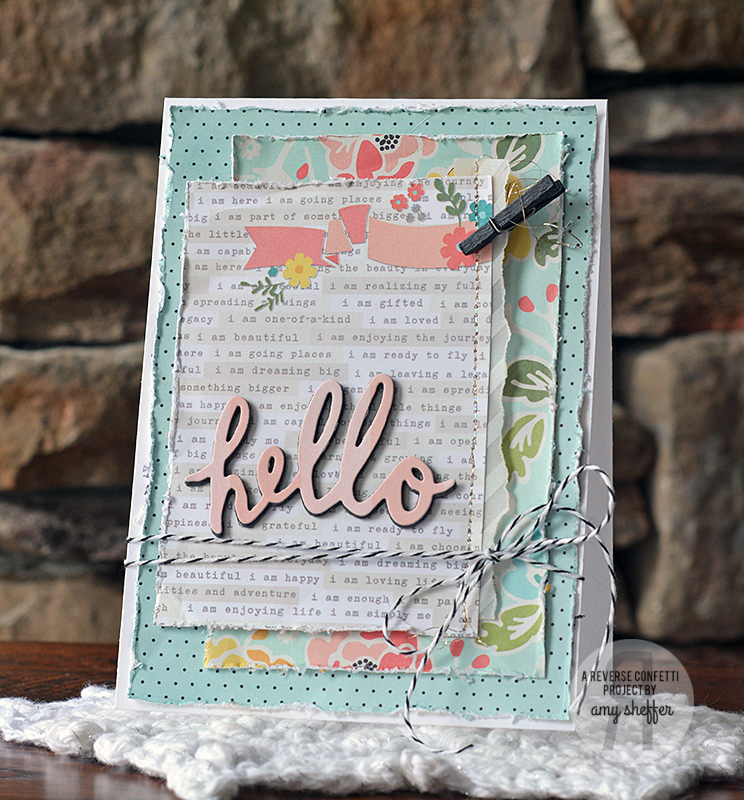 Today is the third of Papertrey Ink's April Release group posts, and we're introducing another of Betsy's fabulous Make It Market Mini Kits. 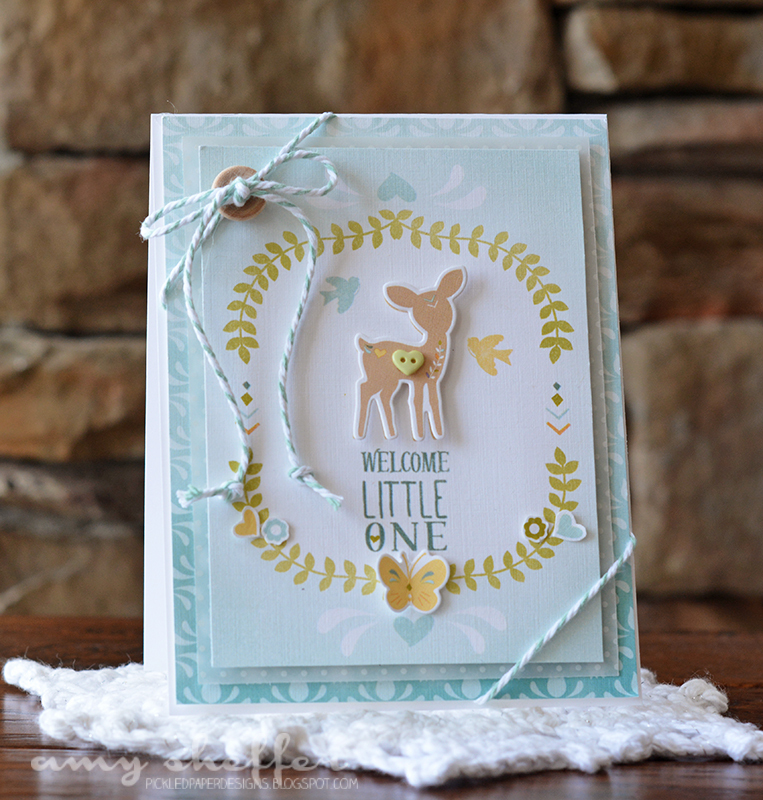 This one is called Wee Folk, and is just as sweet as can be! Before I get to my projects, just a quick reminder that all of the April release products will be available in the Papertrey Ink store tomorrow, April 15, at 10 pm EST. Make It Market Mini Kit: Wee Folk comes with a folk art-style stamp set, companion dies, beautiful papers (boy papers and girl papers), and some darling embellishments. My first card is super simple and quick to assemble. 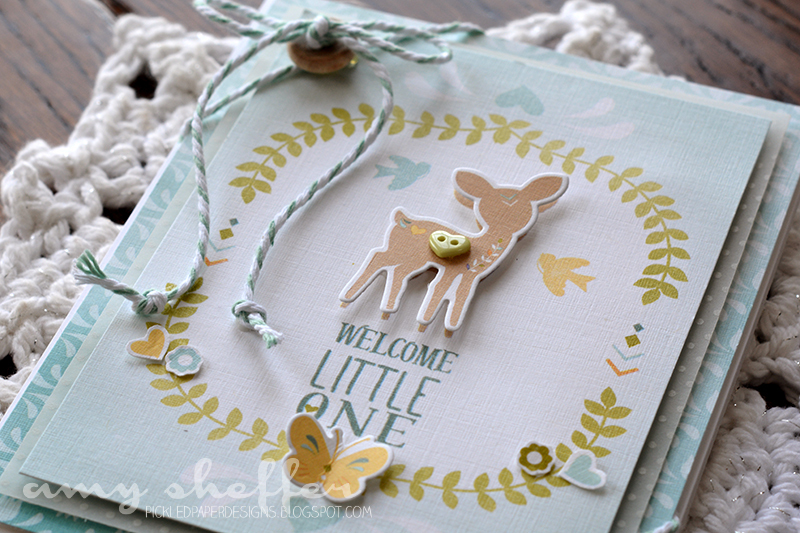 The papers are so gorgeous and stand alone beautifully with little embellishing. I trimmed down the main panel, adhered it to a slightly larger panel of polka dot Sheer Basics vellum, then mounted it to another of the Wee Folk patterns. I wrapped some twine on the diagonal, package-style, and tied off with a wood button from the kit, before mounting to a white card base. 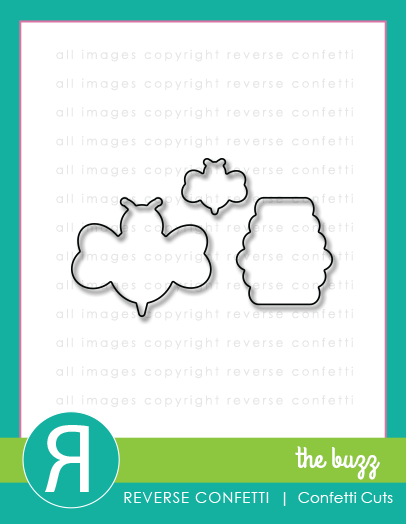 Just like the Clipsters Make It Market mini kit from the March release, this kit has a printed sheet specifically for die-cutting. Just center the die inside the printed outline and your image will cut perfectly. I die-cut a deer and popped it up as a second layer over the first deer. I also added a few other pre-printed die-cuts to the garland along the bottom. Super quick and easy! This next card is a little more involved. 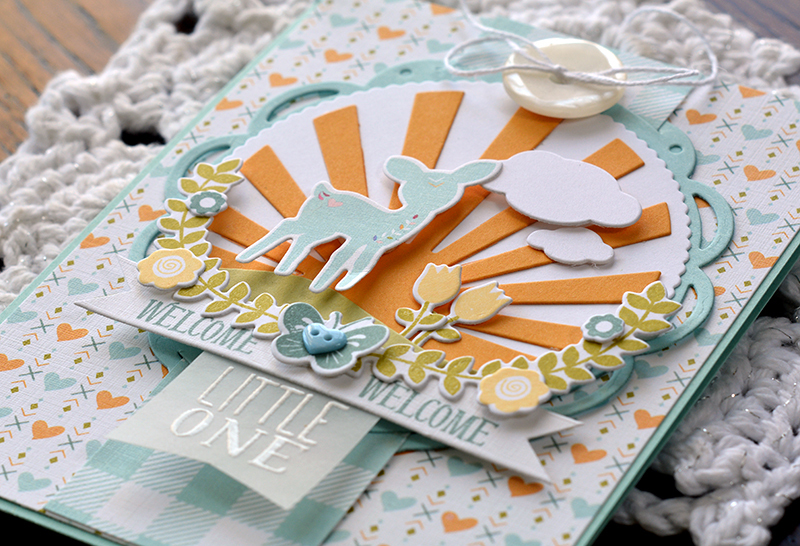 Flagrant layering going on here, folks ;) I started with a new Scene It: Doily Tag Base diecut in Aqua Mist. On top of that is a Scene It: Basic Backer layer in white. And on top of that is a Summer Sunrise sun layer and two white clouds, done with the Scene It: Skycapes dies. The green hill was cut with a Scene It: Everyday die. 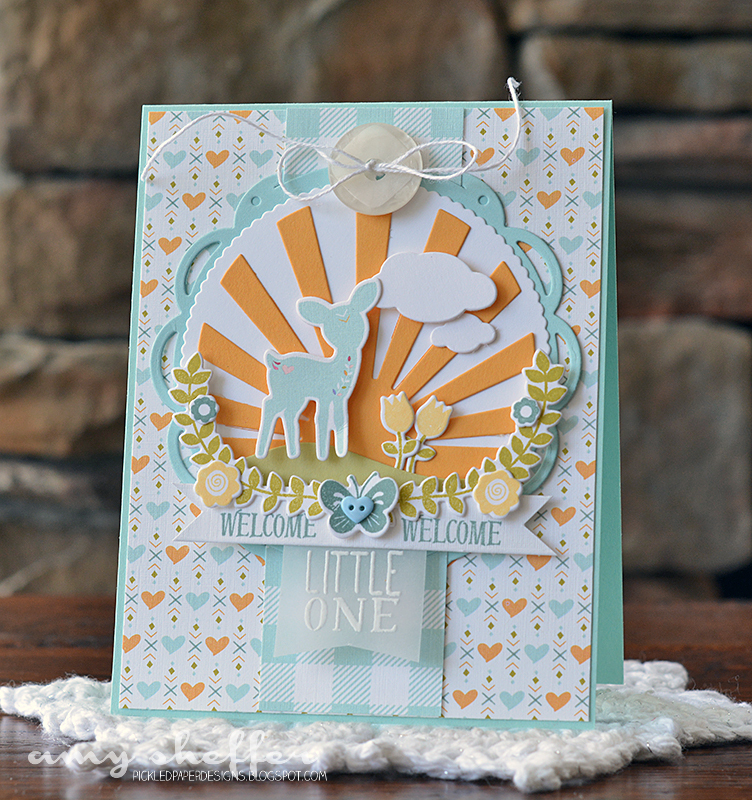 The deer is from the pre-printed die-cut sheet in the Wee Folk kit. The tulips, garland, flowers, and butterfly were all stamped and diecut. The sentiment is stamped in two parts - "welcome" in Ocean Tides on a Double-Ended Banner diecut, and "little" one in Versamark on vellum, then heat embossed in white. I wove a strip of Chicken Scratch Gingham paper in aqua mist through the slits in the Scene It: Doily Tag Base, and then layered the whole shebang onto the lovely heart pattern from the Wee Folk kit.